Now that you’ve watched it, let me ask you a question. Does this arrangement look complicated? Hehe…I knew you were going to say that. This was actually quite easy to play? Well – it is easy to play. (I’m not just saying that). In fact, even newbie jazz guitar students I’ve taught have been able to quickly put together a version of All The Things You Are like this without much hassle. Well, my apprentice, through using some special chord voicings that you only need two fingers to play. This frees up your hand from those big chunky chord voicings that ‘strap’ your hand down with no room to move. In fact, some of these voicings have only two notes (the 3rd and 7th), yet fill out the harmony nicely. Chord melody can be very simple. In fact, the simplest approaches are often the BEST approaches. What if I was to tell you that you can learn this exact arrangement of All The Things You Are on the above video, with handy diagrams, charts and a complete end to end video walkthrough showing you every secret I used? 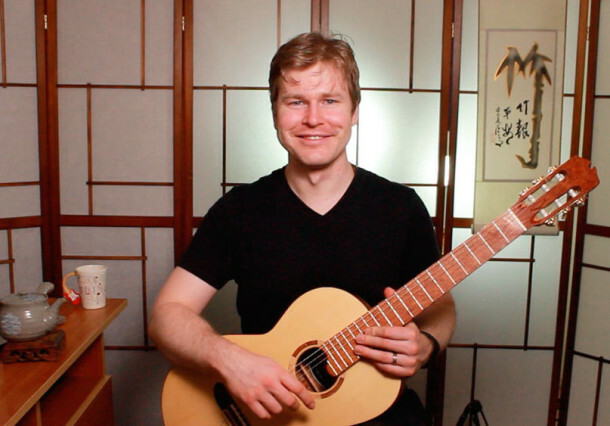 In the first public month of my (until recently top-secret) FretDojo Academy Club, you get exactly this – instructions on how to build this arrangement of All The Things You Are, step-by-step. That’s along with the other lessons on this tune such as playing the melody, comping, analysis, single line soloing approaches – you basically get the whole kaboodle. (But that’s not even mentioning the two tunes from previous months since the Club started you also get access to. Or the special lesson series on walking bass for jazz guitar…but that’s another story). Note: The 69% discount is valid for the next 2 days only. After that, the price goes back to normal. (Enter coupon code ‘CLUB69’ at checkout to get the discount). Yes, when you sign up for the Club you get instant access to all the tunes from the previous months, including All The Things You Are.